We wrote about this yesterday when the rumors were floating that the Cincinnati Reds were in serious talks with Zach Duke, but he’s signing with them according to Jon Heyman of MLB Network. As noted yesterday, there could be a way to maximize his production versus how he was used in the 2018 season by the Mariners and Twins. As a left-handed reliever the first thing we all look for is how a guy performs against left-handed hitters. In 2018, Zach Duke was rather dominant. The sample size was small – he faced just 99 lefties – but he held them to a .220/.283/.319 line with 7 walks and 25 strikeouts. Things were not so strong against right-handed hitters. They hit .311/.403/.370 against him. Not much power, but he walked 14 batters with just 26 strikeouts in 141 plate appearances. Last season he posted a 4.15 ERA between his stops in Seattle and Minnesota. The left-handed reliever also had a huge ground ball rate at 59.4%. Coupling him with Jared Hughes and Michael Lorenzen gives the Cincinnati Reds bullpen a trio of high ground ball rate guys to go to in just about any situation throughout the game. The Reds efforts to get the pitching keep paying off as they have added plenty of depth to their rotation, and as a result their bullpen. This signing just keeps that going. Contract details are not yet available, but this post will be updated once they are. What does ZiPS project for the Cincinnati Reds in 2019? Solid signing, and, if DB uses Duke according to his stats, this could be a fantastic signing. Note to DB: ZACH DUKE IS A LOOGY. Do not use him in any other way, even if his stats as a LOOGY look phenomenal. Full agreement CI3J. 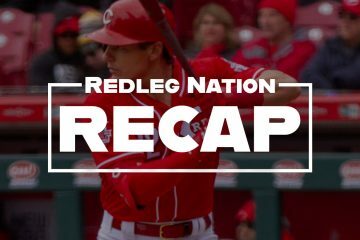 Every trade or signing the Reds have completed this off season may fall flat, but every trade and signing were goof efforts with a plan in place. I think the efforts by DW/NK/DB will pay huge dividends in the 2019 season and lead to a future boost after the 2019 season. With the changes and expansion to the coaching staff and support staff, there’s every reason for confidence in the decision making of DB and his staff. Circle these days on your calendars: 02/23/19 & 03/28/19. Reds fans have something to look forward to this season. John Fay with big news. DW says the Reds will give Nick Senzel every opportunity to focus on CF, learn CF, play CF , improve in CF. That sounds like Senzel is the new Reds CF and the wording easily segues into a 3 week stint in AAA to open the season and play CF until service time issues play out. The reds will say they want him to play every day in AAA to get reps and familiarity with a new position. Winker, Senzel, and Puig could a great OF. Trade Schebler/ Barnhart/ and India for Realmuto and the Reds have on offensive Juggernaut . +1 on that post Old School. Sign me up for that! Agree but does this fit the thought process of our new pitching coach?Isn’t he the guy who prefers guys that throw gas for multiple innings?No reason why it won’t work and I hope it does but if he goes longer he will get exposed.We shall see and I echo almost everybody on this site in that it sure beats setting on our backside with no clue as t what may be needed.Go Reds. It appears the Reds have decided much of the young, underperforming pitching talent needs to hone their trade back in the minor leagues. I think this is a very good sign, though few of them were really “rushed” to the major leagues, having these guys get pounded at GABP is not optimum. I’d guess it’s a major league deal, but who knows, could be a minor league deal. Wonder who comes off the roster if it is a ML deal? If it were up to me I’d say Wandy comes off. If it is a major league deal, it further reinforces the message that this team is trying to win, and win now. The young pitchers have had four years to prove themselves, and only one has done so to the point where he is a lock for the rotation, and that is Luis Castillo. As was opined by Chad on today’s Redleg Nation podcast, Robert Stephenson is likely history. He’s out of options, and the addition of Duke may mean any spot on the 25-man roster for Stephenson is gone (barring injuries, of course). The Louisville rotation may be Tyler Mahle, Sal Romano, Lucas Sims, Cody Reed and Brandon Finnegan. Gentlemen, you five battle it out to determine who has first dibs when a starter is needed from the minors. You five also battle to prove to the front office who should be inserted into the 2020 rotation should Alex Wood and-or Tanner Roark leave after the season. There is no way that this entire group of young pitchers was ever going to make it big as an entire group. The way things are stacking up for 2019, the front office will get a good idea of who is at the top of the “class,” and who will not be part of the near future. In this respect, the “rebuild” will have been a success, in my opinion. In some ways, the Reds are mirroring the successful Cubs and Astros rebuilds. Both of those teams started to gather veteran players from outside the organization after a four-year period focused on developing from within. In year five, the Cubs went out and got Jon Lester and John Lackey. The Reds have gotten … well, you know the list. Jackson Stephens is still on the 40 man? HTF did that happen. Maybe it’s Jackson Stephens but he’s shown enough to me to keep giving him chances. He has a solid enough FB paired with a super good curveball, with one of the better spin rates in baseball. That’s a guy that could be useful as a reliever. I just want Wandy gone so I never have to see him walk the first batter he faces over and over again. He really infuriated me with that nonsense. In other news, the Reds and the Marlins are in “super advanced double top secret” negotiations on JT Realmuto. Dodgers, San Diego, and rest of MLB “on the periphery.” Reds “making progress” but not as much as they were the last 12 times they made progress. In all seriousness, would love to see them pickup JTR. In the meantime I like the Duke signing. Bullpen could use some improvement. As @Old-school said above, looks like CF is going to be Senzel. Hope the kid can handle it. He should be able to, I’ve heard nothing except what a great athlete he is. So, let’s dream and assume the Reds get Realmuto. How would you make the lineup? * I know a lot of people are going to be upset I have Peraza hitting leadoff, but hear me out. Peraza put up a nearly league average OPS+ last season (97) in his age 24 season. I truly believe Peraza is going to make a huge leap forward this year and become an 20/20 player with a .350+ OBP. If he gets on consistently, having Winker and Votto following him will give him plenty of chances to get in scoring position while they work their counts. Basically, the Billy Hamilton Dream, but I actually believe Peraza can do it. ** Senzel hits at the bottom until he shows he can handle MLB pitching. If he can, re-assess and go from there. If Peraza and Senzel live up to their potential, this lineup could be absolutely brutal for any opposing pitcher to navigate. Benintendi was ready early. Senzel can too. Id stay with Peraza at #8 so his speed can be on base when the line up turns over . Votto is now a 2 hole hitter imo with a good lineup. Winker says he likes hitting in the 5/6 hole. With Winker’s on base skills, Puig almost becomes a second 4 hole hitter to unclog the bases in the #7 hole. Winker says he likes hitting in the 5/6 hole. Really? That’s the first I’ve heard of that. Well, if that’s the case, then your lineup looks good too. I like the lefty/righty alternating! Point is, you could pretty much draw names from a hat and still construct a pretty solid lineup. When was the last time the Reds could say that? I get that you’re projecting Peraza to be better, by a good amount. I also understand that he hit at the top of the lineup quite a bit last year. But in that lineup he’s the worst offensive player, by a decent amount. Which makes for a good lineup, but not someone I’d give more at bats to than anyone else on the club. I believe the best players should get the most at bats. By last year’s wRC+ it went Peraza 97, Puig 123, Gennett 125, Realmuto 126, Winker 128, Votto 131, Suarez 135. Senzel is projected (Steamer) to have a 109 wRC+ in 2019. I do think there’s room, and reason to believe, Peraza will improve, but he’s got a long way to go to bridge the gap to any of the guys who played in 2018. You know what? I’m going to go out on a limb and say that Peraza will NOT have the lowest wRC+ of the starters in 2019. I really, really believe a breakout is coming for him and he’s going to surprise some people. I saw his ZiPS projection on Fangraphs, and they have him hitting fewer HRs in 2019 (11 vs 14) while also hitting slightly worse overall for an wRC+ of 87. I’m really not sure why they think a young player who showed significant progress last season would take such a large step backward this season, but there it is. I’ll go on the record as saying I think Fangraphs got this one very, very wrong. I would agree with you that I don’t see him taking a step backwards and the projection is probably off. I’m just not at the point that I think he’s going to have a wRC+ 120’s either. I hope it happens. That lineup would strike fear in any opposing rotation. I agree that Peraza’s improvement at the plate was somewhat overlooked. He had the most hits of any Red after the all-star break (74) and the fourth-most hits for the entire year of any player in the National League (182, one more than Scooter Gennett). His walk-to-strikeout ratio (29-to-75) was abysmal, but he showed he can hit. Maybe Turner Ward can help with the patience at the plate. I care little about lineup construction. In the K/BB/HR MLB of 2019, hit more HRs and most of your problems are solved. However, hitting Peraza leadoff feels sub-optimal, unless he learns patience at the plate. 7 walks on the road last season in 318 ABs…(22 in 314 at home). And, there is often that 5th time that the leadoff guy gets to hit….Peraza is the guy you want with game (often) on the line at the end? Plus, if Realmuto is hitting seventh, why trade for him? 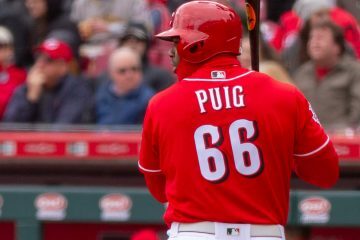 A projected 3.8 WAR guy, hitting below Puig and Gennett (projected 1.4 WAR in 2019)? Lineup contraction may not make a huge difference, but having guys on base before the guys who hit those homers will make a big difference. With Votto and Winker both likely to be around (or above) .400 OBP, having those guys on before Puig, Suarez, Gennett, and Realmuto makes a lot of sense. Winker 1st, Votto 2nd would probably work well, especially if Winker can show more power. We are in an era where Anthony Rizzo is much more dangerous as a leadoff hitter than Peraza…more power, better eye for walks. Votto has been the leadoff hitter only once, in a game in 2008. Shows how much things have changed. “Young Votto” playing in 2019 would likely be the most dangerous leadoff guy in all of MLB. Zach Duke is a good supplement to the bullpen. It was needed on the left side. Don’t throw Robert Stephenson under the bus just yet. I really want to see what Derek Johnson can do here. I just have a feeling that Stephenson will highly challenge DeSclafani for the 5th spot. He doesn’t have that 5th spot locked up. But DeSclafani has an option left. He also could be the one traded by end of spring training. That battle for the 5th spot should be grand. Realmuto becomes a Red by end of the weekend. Stephenson’s light bulb has expired. I didn’t notice it the first time I looked at Duke’s stats, but a 3.01 FIP really shows that last year was not nearly as bad as ERA indicate. Even his 5+ ERA with Mariners had a good FIP. This looks like a good, smart move by Reds if they use him correctly (LOOGY). If I remember right, the other guy they just signed to a minors deal was also a LHP. It seems the Reds had/have a goal in mind to strengthen the bullpen’s depth in LHs. So far, really like how the Reds have planned out this offseason – hopefully, this carries over into a great 2019 season! If we get Realmotu, I just have this feeling inside that we contend for at least the wild card. I don’t know what it is. Maybe its just that gut feeling of having hope for this team for the first time in a long time. I agree. The everyday lineup would be perhaps the best in baseball offensively. Admittedly, it will likely be below average defensively, based on what we know about these players. (There are some who will argue that defense is less important these days with the number of strikeouts and home runs on the rise.) If the three newly acquired starters pitch just to their career averages, the Reds will have a shot to win every day. 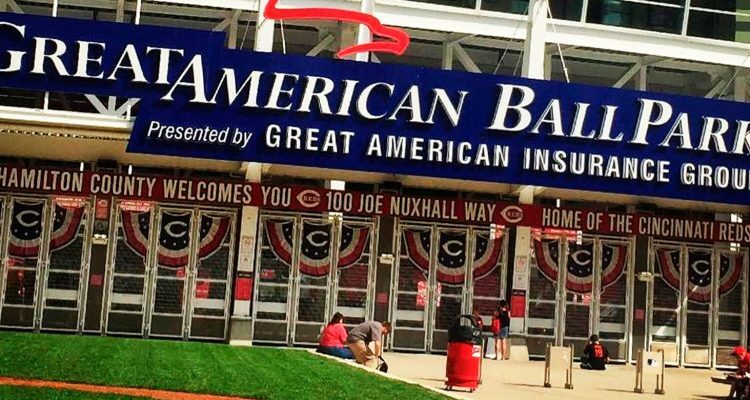 Any chance the delay in announcing has to do with Reds trying to finalize another move preventing them from having to remove a player from the 40 man? More likely getting physicals completed after agreeing to terms before the contract is finalized. I hope all the moves made this offseason work but I can’t get too excited over a relief pitcher with an ERA over 4. I don’t think I’m being a downer. Just being realistic. We all will find out soon enough. Within an 8 hour period today on Realmuto, the Rays are in. The Rays are out. One less team involved is good for the Reds.